Members of the Children's Campus community gathered for the 2018 Vernon Collins Oration delivered by Professor Sandra Eades​, on Wednesday 3 October, 2018. The Vernon Collins Oration was established in 1981 to honour the memory of Dr Collins. The oration was held bi-annually until 1987, and annually since 1989. 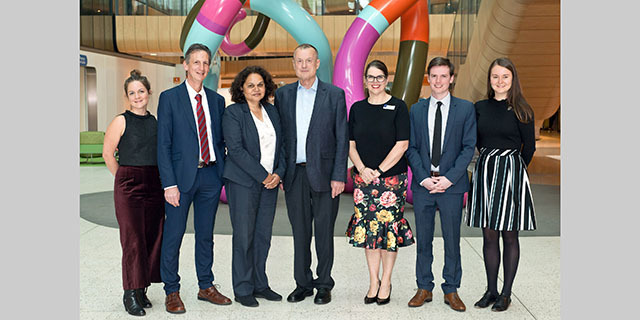 It is conducted under the auspices of the hospital's management, the Medical Staff Association, The University of Melbourne and the RCH Alumni. 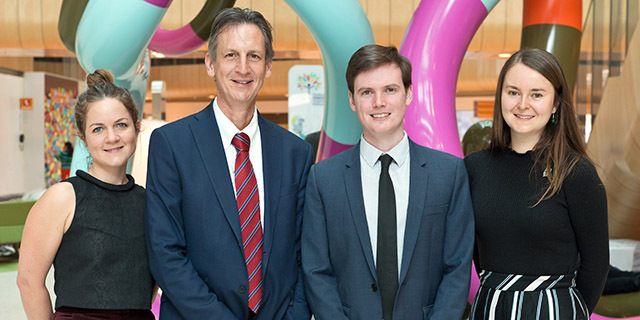 At the Oration, Professor Nigel Curtis, Acting Head, Department of Paediatrics at The University of Melbourne, presented the 2018 University of Melbourne Medical School Prizes to students Rose Hadden, Eleanor Nicklason and Cameron Venus. Inspired by the leadership and legacy of Professor Collins, these prizes acknowledge some of the university's best and brightest medical students. Eleanor moved to Melbourne from Hobart, to study at the University of Melbourne under the Chancellor's Scholar's programme. Eleanor graduated in Biomedicine with first class honours majoring in immunology, also completing a Diploma in German. Research projects Eleanor has been involved in drew on her interests in immunology and ophthalmology, which investigated complement activation in systemic lupus erythematosus and inflammatory bowel disease, in particular, the effect on the retina. She has been included on the Dean's Honour Roll throughout her medical studies. Rose is in her final year of Medicine at the University of Melbourne and is interested in Paediatric and Adolescent Gynaecology. She enjoyed her six-month research project at the Royal Children's Hospital earlier this year with the Gynaecology team, working in collaboration with the 3D printing laboratory at the Austin Hospital. She is a qualified Veterinarian and is passionate about health equity. She received a Dean's award for her contribution to public health work in Indigenous communities in her Veterinary degree. Cameron is a final year medical student at the University of Melbourne based at the Royal Melbourne Hospital, where he will also be completing his internship in 2019. His main clinical interests are internal medicine, paediatrics and psychiatry. As part of his final year studies he recently completed a research project on "Evidence-poor medicine: Just how evidence-based are Australian clinical practice guidelines?". He is also passionate about medical education, and currently presents regular revision lectures to the first year medical students at the Melbourne Medical School.